PolyNation by Trevor Coleman & Co. The Polycyclic Trilogy is the outcome of 3 years intensive work on a new way to compose music. The resulting music is expressed across 3 albums and 3 genres - Chamber, Jazz and World music. Musicians from diverse locations and backgrounds generously and courageously donated their skills and passion to help realize this project for what it is: to create beauty, and the impression of simplicity, over a complex foundation using polycycles. Let’s define one cycle as a musical idea within a fixed timeframe. When this cycle is repeated, the length of the timeframe remains constant. Although the musical idea may undergo change over time, it will continue its integral relationship with the timeframe. Simultaneously, let’s introduce a 2nd repeating cycle that is longer than the 1st. Being longer, the 2nd cycle will repeat at a later point in time than the 1st one. This is already a polycycle, in this case a bi-cycle: 2 cycles, each repeating at different points in time, each containing fluctuating yet coherent musical ideas. Add a third cycle, longer still, and you have a tri-cycle: 3 cycles, all repeating at different points in time, all containing fluctuating yet coherent musical ideas. As a simple analogy, let’s imagine 3 uni-cycles: one small, one medium, one large. They begin their journey at the same time and travel at the same speed but to reach the same destination at the same time, the wheel of the small uni-cycle will rotate more times than the medium sized one, who will also rotate more times than the large one. We can organize polycyclic music by using a simple mathematic equation and adherence to the same tempo or beat. . Let’s say the 1st cycle is 3 beats long, the 2nd cycle 4 beats, and the 3rd cycle 5 beats. They begin at the same time, each on their 1st beat and continue at the same tempo. Due to their different lengths they are already out of sync with each other by their 1st repeat. How many beats and repeats until the next time they all simultaneously arrive on the 1st beat of their respective cycles? The equation is simply: 3x4x5 which equals 60. Only on the 61st beat do they share the 1st beat again. So, the 3 beat cycle needs to repeat 20 times to equal 60 beats; the 4 beat cycle repeats 15 times; and the 5 beat cycle repeats 12 times to complete what I call a ‘Mother Cycle’ - in this combination the Mother Cycle is 60 beats long. Why would you use Polycycles? Although there are many exceptions, most music is organized into groupings of 4 beats, which repeat and provide a basis to create patterns and structures. One grouping of 4 beats creates a meter which acts as a rhythmic framework and orientation. Most music, and musicians, conform to this single meter, more or less consciously or intuitively, even in quite complex polyrhythmic examples. This mono-metric system is deeply embedded in our functional perception of music. The introduction of polymetric or polycyclic systems challenges the way we perceive music. It also challenges relationships within music: we are now confronted with not only the musical relationships within one metric system, but also with those of a different meter occupying the same temporal space. The addition of a 3rd meter will increase the relational complexity further. Now we have 3 individual cyclic frameworks, complete with their inherent fluctuating relationships, all occupying the same temporal space. (This may already sound familiar to some human relationships…) The potential for sonic chaos is self-evident. Clearly, the underlying design that supports these repeating and competing cycles is critical to the success of a coherent musical experience. A successful polycyclic structure will accommodate all of these variables by creating a platform of compatible relationships that function not only within their individual timeframes but also in the way they cross-fertilize. The result should be an intelligible composite sonic picture that ultimately defies the underlying complexity. Not only an intelligible, but a charismatically satisfying music. Another analogy can be made with the 3 dimensional chess game played by Captain Kirk and Dr. Spock in the Star Trek series. They played in this way because “3D chess can improve starship tactics and inspire three-dimensional thinking”. I propose that, in order to adequately express the modern human condition in a music context, with it’s overlapping complexities in relationships, diversity, information sharing and political conflict… the list goes on… a broader framework is required than what a mono-metric foundation provides. I am not proposing to abandon the mono-metric system but rather to expand upon it. An inclusive disruption. A well-designed polycyclic framework can provide a complex yet secure enough foundation upon which a fluidity of ideas can explore expanded potentialities. Additional benefits may also arise such as the strengthening of the individual position within a complex group setting. Also, performing and improvising in a polycyclic environment sharpens interpersonal awareness. So far, I have only discussed the compositional design of polycyclic music. Another layer of equal interest for me, is the application of improvisation upon this concept. It is within a polycyclic environment that the relationship between composition and improvisation lead to the title of my Doctoral Thesis: Polycyclic Comprovisation. I recommend reading the exegesis for those interested in an in-depth investigation into these concepts. (View/Open) How improvisation is incorporated will be briefly outlined when discussing the polycyclic jazz album below. How do Polycycles work in my 3 albums? 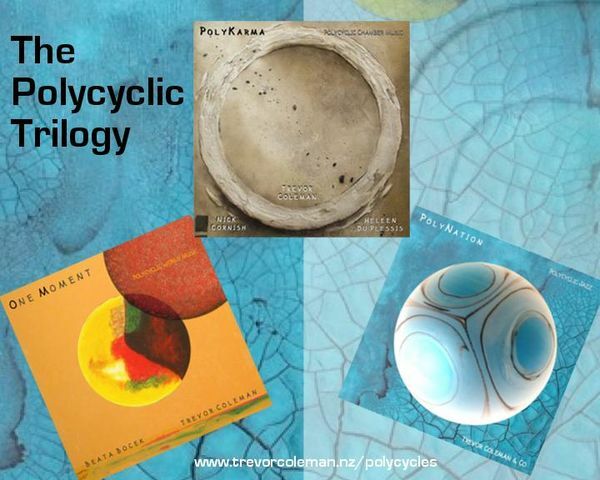 First, the Polycyclic Chamber Music album, entitled ‘PolyKarma’, was composed for a specific trio: cellist Heleen Du Plessis, multi-reed instrumentalist Nick Cornish and myself on piano. Each of the 9 pieces use different polycyclic combinations. In one composition for example, ‘PolySpirals’, the piano is in an 11 beat timeframe, the cor anglais in 5 and cello in 3. The musicians are encouraged to ‘feel’ the rhythmic and melodic momentum inherent in their particular timeframe while developing an awareness of their relationship to the other musicians in their respective timeframes. Rather than an intellectual exercise, the music aspires toward a deceptive simplicity; it’s like, something unusual is happening but the listener need not be distracted by it. There is the option to follow any one contrapuntal line, or just enjoy the composite beauty of the interactive whole. The Polycyclic Jazz album, entitled PolyNation, continues the concept in a jazz context but with more emphasis on improvisation. Featured here is a young singer - Abigail Knudson - who fearlessly navigated the unknown with some stunning vocalise. 3 saxophonists - again, Nick Cornish, with Mike Schweizer in Germany and Craig Walters in Australia, offered masterful responses over the various cycles, while Alphonso Rios animated my rhythm section on congas. When these highly skilled musicians were invited to improvise over these multiple timeframes, they had enormous potential to respond either within their own timeframe, to other timeframes in relation to their own, or even to freely express to the combined sonic canvas. Again, while this may sound overly complex, the music was designed to strike a balance between the familiar traditions found in the jazz heritage, with the unfamiliar territory of polycyclism, resulting in an engaging while not alienating music. Thirdly, the Polycyclic World Music album is called ‘One Moment’. The centrepiece of this work is my collaboration with the Czech singer Beata Bocek. Much of the underlying music is derived from the Chamber Music album, upon which I invited and encouraged Beata to freely improvise from her rich musical heritage. Eastern European vocal traditions combined with Spanish, North African and Middle Eastern rhythms provided by Andalusian percussionist Rafael Garcia, and multiple other stylistic layers and cycles, result in a hauntingly beautiful world fusion. Put your text here to show in the video teaser. Edit text via the media tab in admin.